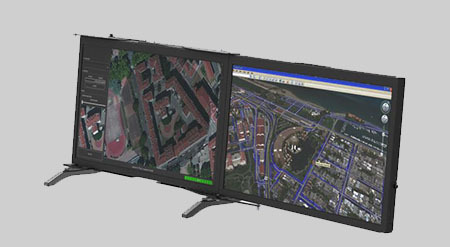 The MaxPac CP family combines the 24.1” displays of the MaxPac XL with a much smaller computer chassis. The user can choose the MaxPac8060CP Core i7/32GB motherboard or the MaxPac8061CP/MaxPac8071CP featuring a Xeon D/128GB motherboard. A single PCIe3.0 x 16 slot supports an optional nVidia Quadro P4000 or P2000 graphics card. Four removable 2.5” SSDs, a DVD or BD are also provided. K&N Filters are a standard feature. 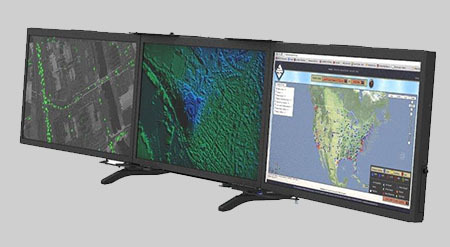 The MaxPac CP6 model is unique in the industry as it supports six 24.1” monitors in a 2 high x 3 wide configuration. All folding open with cables attached in seconds. 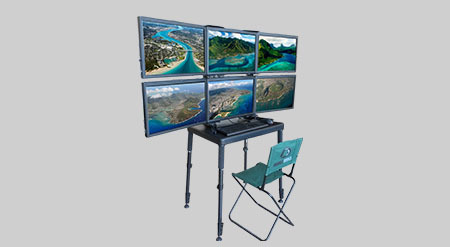 Four of the six monitors also have external VGA inputs to be used with other equipment. The source is selected from the monitor source control on the top of the monitors. The entire system plus a table and chair can fit into a single transit case. The MaxPac CP3, CP2 and the CP1 are a more limited three, two or one 24.1” display configurations in a much smaller transit case. Choice of Core i7 4C/8T up to 32GB or Xeon D 8C/16T or Xeon D 12C/24T up to 128GB. Your choice of single, dual or triple 24.1" 1920 x 1200 displays. Four removable SSDs up to 3.84TB each. Optical drive is replaceable from the front service for easy service. A single PCIe3.0 x 16 slot is available for add in graphics, RAID, Network or other I/O. 300 Watt 90 - 264VAC 50/60Hz.